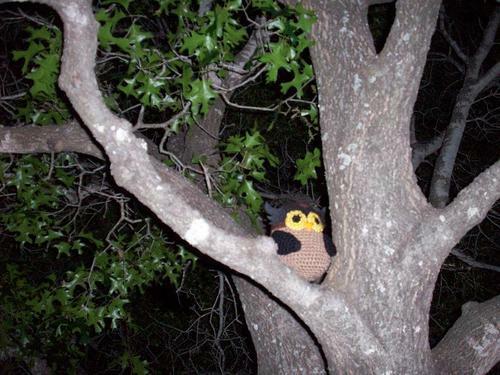 This is an Amigurumi Owl I came up with last night. Aaron has cleverly chosen to name him Hooter (real original) and because it is so simple, I’ve chosen to share my pattern with the world! If you have any questions, feel free to leave them in the comments. The last thing you’ll need to do is sew on the wings, and attach the eye brow. My name is Bethany Marcello, and I write for the yet-to-be-launched Craftfoxes.com – a crafting and social networking site.We’re putting together some great stuff for our upcoming launch, featuring everything from quilting to sewing to crafting and baking. Our editorial intern came across this picture of the… on your site: …, and was wondering if you would grant us permission to use it? We’d give you a link to your site. Wow! Thanks, that would be wonderful. Use any picture from my website as you wish, Craft Foxes seems like it will be a wonderful community! About how big does he end up being? How big does he turn out? Your pattern doesn’t indicate hook size. What size did you use? About how long do these take to make?? They’re adorable!! I am starting my first owl and I have a pattern direction question. Do you use stitch markers and do a continuous round or do you join each round with a slip stitch and chain one? When we start the body, are we starting from the top (head) down? sorry I took so long to reply to this Lolly, I was bombarded with spam comments so I had to weed through them to get to the real ones. The pattern is worked in continuous rounds, I tend not to join rounds in my patterns because it creates a seam going up the entire piece. I finished my owl in two days. Great pattern. Love this pattern! One of my friends is obsessed with owls and the color purple, so I made this little guy using a light and dark purple instead of the browns. It turned out SO cute, I know she’s going to absolutely love it. 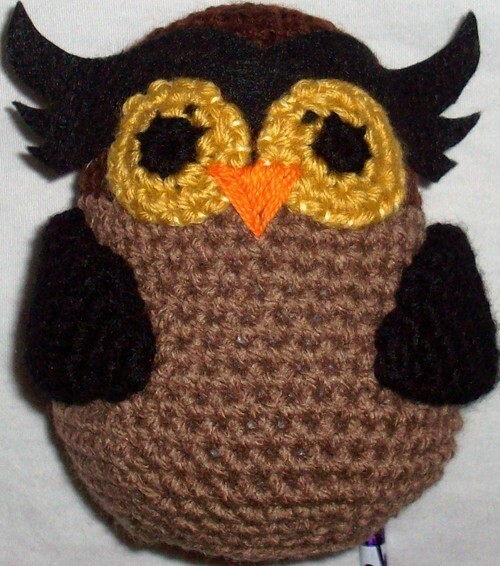 We have a owl challenge in our heckle and knitting group on Facebook and I have linked to this one as an example. I guess I’m the only one who doesn’t understand the wings. I ended up with 2 thimble shaped items… I can’t see how those become the wings in your picture. How are they supposed to be attached? Other than that, he’s super cute! 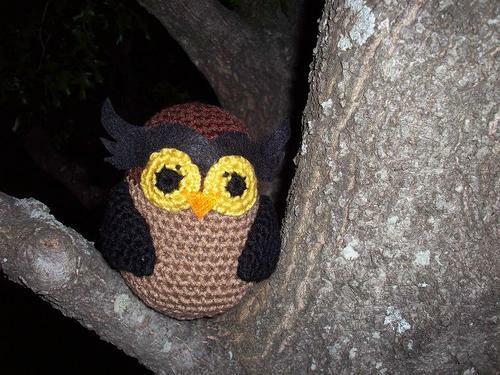 I am about to venture in amigurumi for the first time because my daughter asked me to make her an owl, and this one is adorable! Thanks for the amazing pattern!